Despite working 12 hours a day and exposing herself to toxic chemicals, 55-year old Taslima Begum, a tannery worker in Hazaribagh, an industrial neighbourhood in Bangladesh’s capital Dhaka, earns just US$40 per month. “Yes, the pay is very low and I know the health risks, but I don’t have other alternatives,” she said. The mother-of-five says she has no choice if she is to feed her family and ailing husband. Hazaribagh’s 150 tanneries employ over 12,000 workers. In some cases, conditions in the tanneries are worse than in the notorious garment industry. According to the government’s National Institute of Preventive and Social Medicine, with so many “floating” workers in the sector, the full health impact is not known. “You will not see the same worker for a long time so the health problems are often not diagnosed,” said the Institute’s Manzurul Haque Khan, an assistant professor of occupational and environmental health. Working in dark, congested and unhealthy conditions without protective measures, including masks, many workers get skin or respiratory infections, as well as other serious health ailments, he said. “Over the years, the owners’ profit has increased but our salary does not. We continue to receive a low salary,” said Mohammad Zinnah, a 50-year-old leather worker who has been in the job for the last 25 years. He earns just $100 a month. Most male workers receive $80-$100, while women and children earn $40-50 a month working almost 12 hours a day, seven days a week, IRIN found. Affording medical care is almost impossible. “I’m afraid if I see a doctor I will be diagnosed with a serious illness,” said 22-year-old worker Samiur Rahman, who has been working in the industry for the past seven years. “Hazaribagh is considered one of the most polluted urban environments in the world,” said Richard Pearshouse, a senior health researcher with Human Rights Watch (HRW). Past and present tannery workers described and displayed a full range of health conditions, including prematurely aging; discoloration; itchy, peeling, acid-burned, and rash-covered skin; fingers corroded to stumps; aches, dizziness and nausea; and disfigured or amputated limbs, according to a 2012 HRW report. Many complained that their tannery did not supply gloves, masks, boots and aprons, and if they did, they failed to supply sufficient quantities. “We found extreme industrial pollution, widespread residential health problems, an occupational health crisis among workers, and children performing hazardous work in some tanneries in Hazaribagh,” Pearshouse said. According to the Bangladesh Department of Environment, about 21,600 cubic metres of environmentally hazardous and toxic waste is emitted daily from the tanneries, including chromium, sulphur, ammonium, salt and other chemicals. In 2001, Bangladesh’s High Court ruled that the government should ensure the tanneries install adequate means to treat their waste. However, the government has failed to do that. Later, in 2009, the High Court ruled that the government should relocate the tanneries outside Dhaka or close them down - also ignored. “There’s been talk of relocating to an industrial area for over two decades, but the plan is still bogged down by the industry’s demands for compensation and tax breaks. 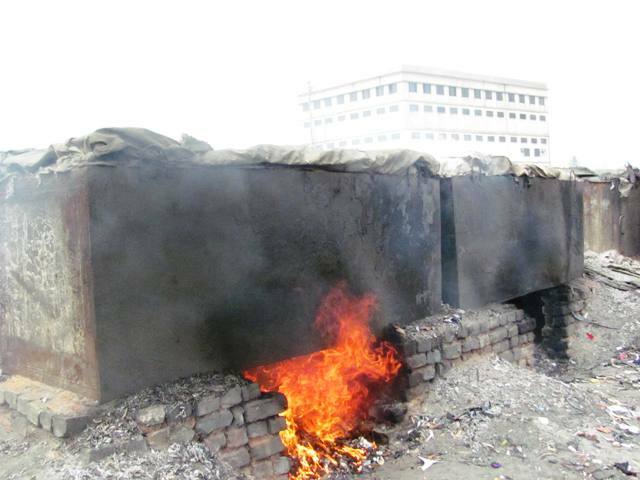 Meanwhile, the health crisis among local residents and the tannery workers continues to grow,” HRW’s Pearshouse said. “The Hazaribagh tannery workers work in very congested areas and they have very old machinery. If tanneries are relocated in a wide space, the working condition could be improved in a great way. But there is no indication that they can be relocated soon,” Philip Gain, executive editor of Society for Environment and Human Development, told IRIN. Gain said workers should be educated about the health risks so that they can put pressure on owners to ensure a safe environment, while HRW’s Pearhouse thinks foreign companies buying leather from Bangladesh should stop looking for the cheapest leather and start monitoring working conditions. Bangladesh exports leather to some 70 countries - mostly China, South Korea, Japan, Italy, Germany, Spain and the USA. Leather export revenues have been increasing by an average of $41 million per year, according to HRW.